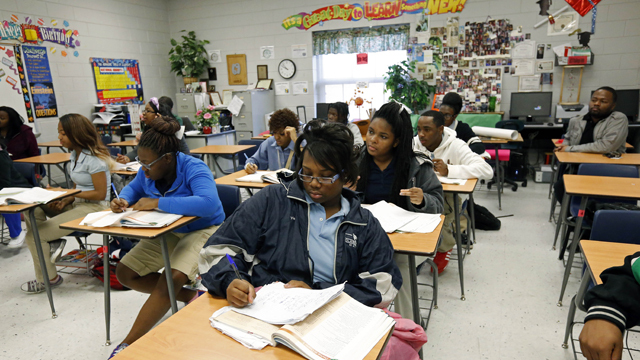 Mississippi is denying good schools to African American students in violation of the federal law that enabled the state to rejoin the union after the Civil War, a legal group alleged Tuesday. The Southern Poverty Law Center wants a federal judge to force state leaders to comply with the 1870 law, which says Mississippi must never deprive any citizen of the "school rights and privileges" described in the state's first post-Civil War constitution. That law still obligates Mississippi to provide a "uniform system of free public schools" for all children, but the state has instead watered down education protections in a white supremacist effort to prevent the education of blacks, the group said. "From 1890 until the present day, Mississippi repeatedly has amended its education clause and has used those amendments to systematically and deliberately deprive African-Americans of the education rights guaranteed to all Mississippi schoolchildren by the 1868 Constitution," the suit states. The named defendants include Gov. Phil Bryant, Lt. Gov. Tate Reeves, House Speaker Philip Gunn and Secretary of State Delbert Hosemann, all Republican elected officials. It also names state school Superintendent Carey Wright and the nine appointed members of the state Board of Education. Mississippi's public schools have stubbornly ranked at or near the bottom of national measures of academic achievement and progress. But Bryant and Reeves said Mississippi's education system is improving under their leadership.